Wide Open Road: This Muesli is Going Places! Sydney road and its tributaries are lush with interesting places to eat, instead of with any sort of natural foliage (interesting given the tree-lined beauty that is its continuation, Royal Parade). Traffic flows sluggishly through this Brunswick artery, hardened with concrete on all sides bar the sky – which on this particular Sunday morning was a warm Autumn blue and happily not yet the steely grey that will set the tone for the coming months. Understand that I say all of this with the wan fondness bred from a life of habitation and there is nowhere in Melbourne that I would rather live! What a dark and mysterious muesli this is! After some of the garish offerings I have witnessed of late I was glad to see this dusky dish appear in front of me. The thing that immediately set the Wide Open Road muesli apart from the rest was the roasted nut and oat crumble lavishly strewn over it. I was particularly pleased to find cashew nuts nestled within the mix adding their smokey creaminess to the dish and giving it the feel of a guilty pleasure rather than a wholesome breakfast – I can never resist a naughty cashew or twenty. 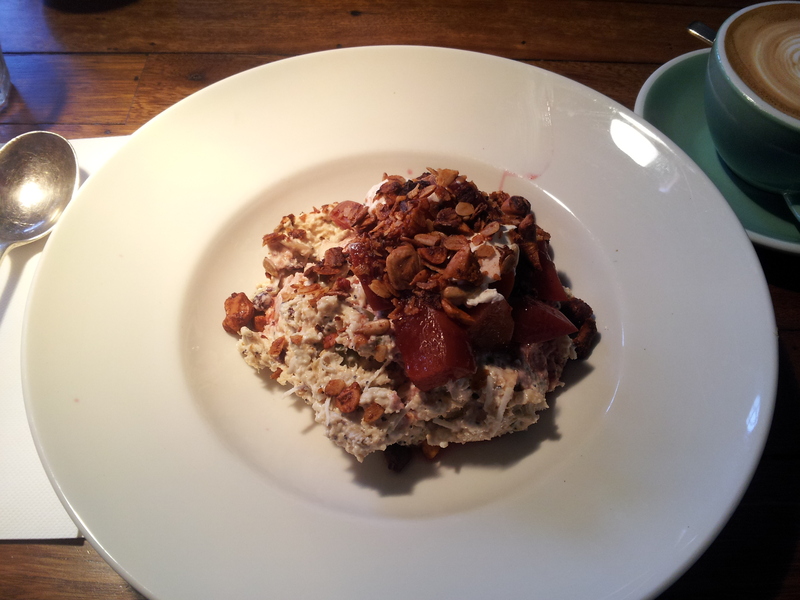 The crunchiness of the crumble almost managed to overshadow the other accompaniment to this muesli, the compote. With the help of Ms Sourdough I was able to determine that it was most likely plum that, thanks to the internet, I can say was masterfully stewed in syrup or sugar (that is, compoted) to the point of soft fleshy semi-resistance. Furthermore, the natural yogurt was tart and dense with a smorgasbord of seeds, namely sunflower and poppy, along with oats, grated apple and an odd sneaky dried apple piece that would give the lucky mouthful a delicious leathery chewiness. The Wide Open Road muesli was packed with flavour and texture, and left me so full that I later turned down free samples of who-knows-what-but-normally-I’d-have-three being handed out in the aisles of Barkly Square Coles. That is just about the highest honour a muesli can earn. Overall: Do not drive to Wide Open Road as this is an ironic name given its proximity to the very congested Sydney road. Rather, find any other means of transport to take yourself to this cosy warehouse and insist upon the muesli – you will not eat until lunch. To commemorate the birthday of Lady Grey, I decided to take her out for breakfast at the cheapest place I could think of. The Green Refectory immediately jumped to mind as I have been there many times and am repeatedly delighted to pay not-very-much for very-lovely-things. Yesterday’s muffins for two dollars? A thousand times yes. Thus, I felt this was the perfect place to show my maker how much I care for her. The Green Refectory is a narrow cafe tucked in next to a shoe store and a tram stop just South of Weston Street on Sydney Road. There is nothing to invite the casual passer-by to enter the glassy facade – no outdoor dining to suggest that this is a place of joyous consumption (and I am not referring to happy Tuberculosis, found in much more tropical climes). Indeed, the bustle of trams, humans and narrow footpaths is a most inhospitable setting for exterior eating and so I commend the Green Refectory for not trying. Do note that for those that enjoy eating in the elements, there is a backyard to this place that I cannot fully remember sitting in but of which I have a vague sense of quaint, leafy claustrophobia. One of the perks of going anywhere to eat at 8:30 on a week-day morning is that a fair proportion of the breakfast-populace has either eaten earlier and gone to work (respectable) or just gone to work (understandable). Happily this allows those with more flexible schedules – at the moment – to swoop in and claim a seat unchallenged. In a place like the Green Refectory where the long wooden tables are often bustling with communal diners and the smaller private tables are much coveted by less sharing individuals (such as myself), an easy week-morning seat was a relief. That relief, however was countered somewhat by the anxiety of having to squint myopically up at the menu etched onto a blackboard above the counter, and then recite accurately my decision to the friendly wait staff. A warning, the busy nature of the Green Refectory is such that I have always had to chase up my coffee, sometimes even having to reorder it. Or at least, I hope this is due to busyness and not disdain for me! Yes, a tower of pink muesli is really what we are seeing here. As if modelled on the Egyptian pyramids, complete with strawberry capstone and sandy-cinnamon perimeter garnish, this flamboyant number is one out of the box. Once I calmed my overstimulated eyeballs, I was able to mush the absurdly, delightfully placed yoghurt into the muesli-proper and eat. What I encountered was a crisp density of apple and nuts. The Green Refectory does not skimp on almonds and hence this meal is a crunch-fest. Between hard foods I also found a strong presence of soft ones, happily including banana – king of breakfast fruit – and a saturation of berries. Indeed, the violent colour of this muesli is most likely not due to a manic chef squirting red food dye/cordial/blood into the breakfast but rather from the natural ooze of broken berries.The Green Refectory muesli also contains the culinary triple threat of the aforementioned banana, cinnamon and honey. Lots of honey. I felt my pancreas thank me for not ordering the sweetened yoghurt as the tartness of the natural yoghurt was all that stood between me and blood-sugar central. Overall: The Green Refectory muesli is a sight to behold and sweetly pleasant to be-taste. It is also very cheap. So if you are after a crunchy wake-up meal and are not afraid to go chasing coffees, roll in to the Green Refectory and grab a muffin as you roll out. The other week I navigated the foggy area of meal-time that is brunch as one of my companions that day, Captain Cappuccino (who just likes chocolate), touts a hearty late-morning meal as his hangover cure. Not being seedy enough to require curing from a midweek hangover I begrudgingly had pre-muesli toast at my normal breakfast time to stem the tide of hunger pains that would no doubt plague me if I did not make inroads into breaking my fast. As toast is not muesli it will certainly not be reviewed here. The venue chosen for this outing was Little Henri, an unassuming (only because I walked right past it, more a comment on my lack of observation) building on High Street, just South of Dundas Street in Thornbury. Little Henri can be summarised as an aloof warehouse. The high ceilings, regimented timber and metal furnishings as well as the large timber-framed windows create an atmosphere of airy anonymity – this building does not care who dines, just that the function of dining is accomplished. This is in contrast to cosy-warehouses that envelop you with warmth and lavish you with attention. OK, perhaps I have never been to a cosy warehouse and maybe they don’t exist but I’m making the point that Little Henri feels aloof so there you go. This is not to say that I didn’t like the interior, I found the clean, repetitive, industrial style of it all very pleasing – it appeals to the obsessive compulsive in me who in principle hates clutter and irregularity (but in practice is clumsy so things tend to get knocked askew). Muesli on a plate! Things sure do get weird around brunch-time. I am, however, of the school that plates are for meat and (three) vegetables, not oats and their associates. Every morsel of a breakfast needs to be able to be scraped up and without a bowl we are getting into spoon-and-knife territory – and you don’t bring a knife to a muesli fight. Just a bowl. Moving on to the muesli itself, I was intrigued reading the menu as to what rose petals would be contributing to the dish. I had visions of blood-red petals artfully arranged – a romantic offering from the seemingly aloof Henri? 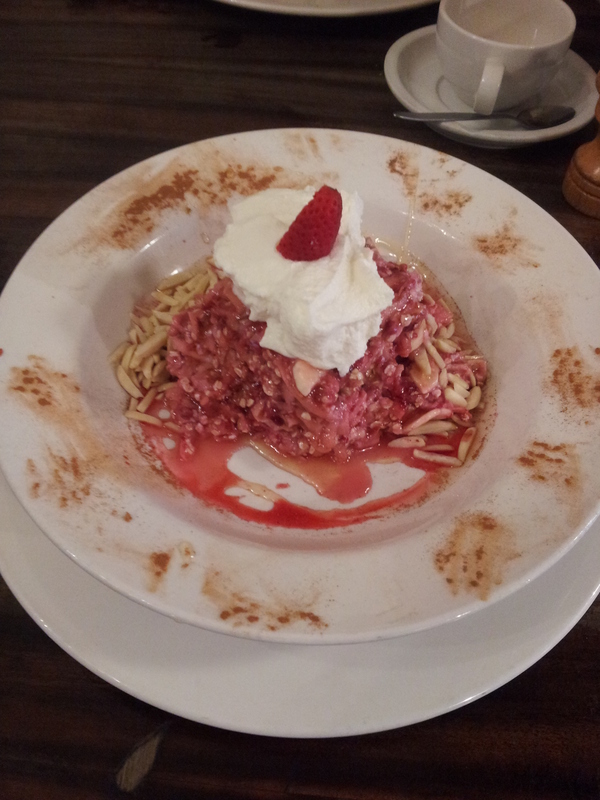 What came out was much more grounded in culinary reality and was a lovely surprise. The rose petals gave this muesli a hint of the Mediterranean which served to accentuate the cool, tart yoghurt. 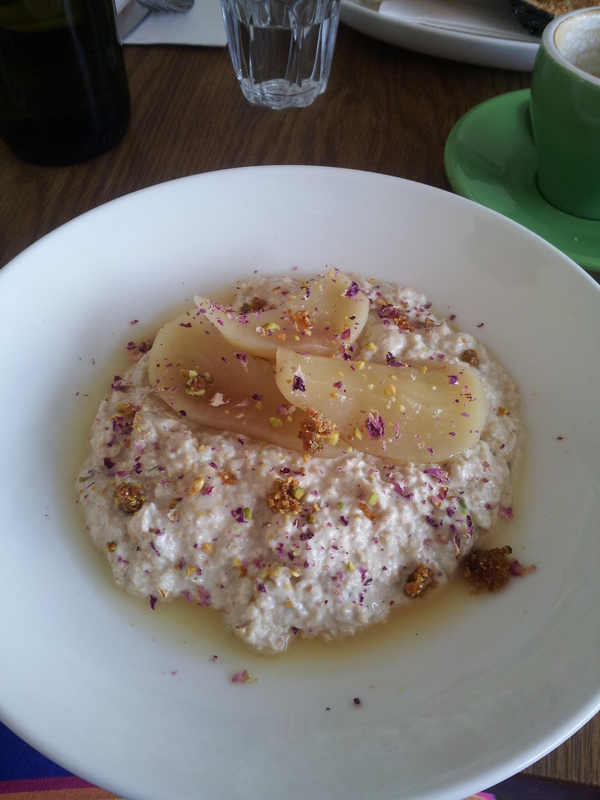 The poached pear – which is now becoming my favourite muesli accompaniment – was moist, crunchy and subtly sweet. Another innovation in the Little Henri muesli were the chewy clusters of (probably) honey-roasted oats and pistachio scattered throughout. These not only fulfilled my love of chewing, but also my love of oats. Oats are wonderful nestled in yoghurt, but they are also divine in biscuits and cakes. Little Henri managed to combine the two personalities of oats – the respectable breakfast oat with the cheeky dessert oat – to create a deliciously original muesli. Final Word: Find Little Henri and ask for his muesli. Despite this cafe’s coolness, it will serve you up an innovative breakfast that will only leave you wanting more.